In the daily struggle to lose or maintain a healthy weight, we all have our guilty pleasures, especially when it comes to starches. Breads, potatoes, pasta and rice are some of the most common staples of our daily diet that can be extremely difficult to avoid. Those starches stick around for a long time, particularly in the gut area and hips. But now there is a tool to help combat our bodies' love/hate relationship with carbohydrates. Carb Block Ultra is an innovate starch blocker that is clinically researched to move carbohydrates out of the body quickly to keep them from being absorbed. This all-natural, stimulant-free weight loss supplement utilizes white kidney bean extract to stop enzymes from binding with starches, preventing them from breaking down into easily absorbable molecules. Instead, the carbohydrates are quickly passed through the digestive tract and out of the body, without being absorbed so you can lose weight easier and faster. This also gives you a 'full' feeling in your stomach so you're less focused on your appetite. The less fat you absorb from those starches, the more your body is forced to burn its own fat reserves, so you can start shedding those unwanted pounds. Carb Block Ultra can also support healthy blood sugar levels within a normal range so you can lead a healthier and happier life. Because it is caffeine and stimulant-free, Carb Block Ultra is an ideal product to use a synergistic stack with, such as a thermogenic fat burner or workout supplement. 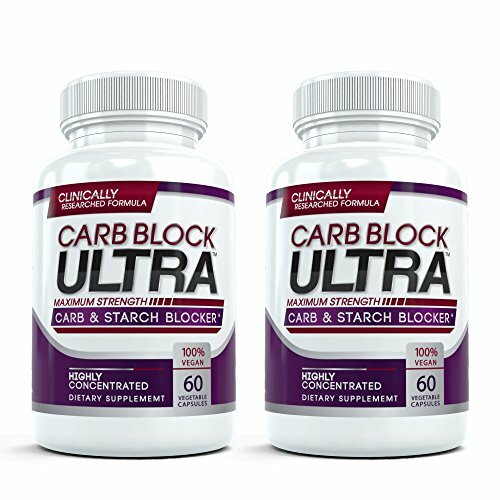 SAFE, NATURAL WEIGHT LOSS: Carb Block Ultra is the top-rated starch blocker on the market today. This high-quality formula utilizes the body's own natural processes and is especially useful in helping to spur fat loss in key trouble areas like the belly, thighs and buttocks. Plus, you'll feel fuller and more satisfied after eating, providing for optimal weight loss conditions. NEUTRALIZE CARBOHYDRATES: White kidney bean extract helps to prevent carbohydrates from breaking down, preventing the body from absorbing fat and sugars from the calorie rich starches. With fewer calories absorbed, the body turns to its own fat reserves for energy, leading to optimal weight loss conditions. NO CRAZY DIET FADS NEEDED: Whether you're just trying to drop a few pounds or are making a big lifestyle change, Carb Block Ultra promotes healthy weight management without having to follow any dangerous and expensive fad diet plan. This tried and tested supplement breaks down starch molecules before they can be absorbed, sending them through the digestive tract and out of the body. If you have any questions about this product by Carb Block Ultra, contact us by completing and submitting the form below. If you are looking for a specif part number, please include it with your message.